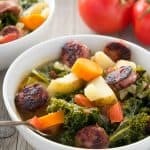 This soup is so easy to make you might be surprised it's as delicious as it is - complete with crispy sausage and kale! Using sauté setting on Instant Pot ­- Once hot, add oil and cook sausage until crispy. About 3 minutes each side. Remove and set aside. Add onions, carrots, celery, thyme, and vinegar ­ cook for 3 minutes, making sure to scrape up bits from bottom. Add all remaining ingredients (except sausage) to pot and mix well. Lock lick and cook for 5 minutes at high pressure. Once time is complete, quick­-release pressure then remove lid. Remove bay leaf and thyme sprigs. Add sausage slices to pot and mix well.